GROGNARDIA: Oubliette #8 Available -- for Free! Oubliette #8 Available -- for Free! 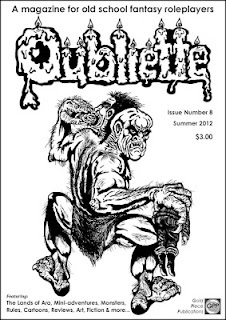 As he usually does, editor Peter Regan has made the PDF of the latest issue of the excellent Labyrinth Lord fanzine, Oubliette, available for free for a limited time. A print version, along with a print compilation of issues 5 through 8 will be available later this month. I'm very fond of Oubliette, which reminds me of the best stuff White Dwarf did back in the day. The artwork by The Marg in every issue is especially delightful and gives Oubliette a style all its own. Check it out if you haven't already done so. I would like to know how that's pronounced. Many thanks for the shout out. It's given the number of downloads a healthy boost over the last few hours. Wow. I wasn't even close! Went to site, some kind of sales site. Where is direct link to PDF? Thanks. There's no direct link of which I am aware, only the link to RPGNow.com.